Ah, feeling guilty. It really does make you feel like a huge weight is on your shoulders the whole time, doesn't it? I used to think my entire life was run by my feelings of guilt. Everything I did or thought seemed to be governed by how guilty I felt that day. It also didn’t seem to matter what "it" was. I’d be feeling guilty about everything and anything. Either that I hadn’t done enough or that I’d upset people when I hadn’t meant to or even that I "should" have done something differently. I’d feel guilty about so many things and my life really did seem to be just reacting to one feeling of guilt after another. To be clear what we're talking about in this article, guilt isn't always "bad". It can be a good thing in that it can prevent you from taking actions that could hurt someone else. Guilt can also prevent you from damaging your relationships with others because you'll think before you act. Or it might be that push you need to fix your mistakes. What we're talking about here though is guilt that continues long after the event or is excessive to the point that it prevents you from focusing on what's important or even impairs your ability to enjoy your life. It’s very draining and distressing living with a constant feeling of guilt. It also stops you from making the most effective and efficient decisions. In other words, you’ll end up making bad decisions simply because you’re reacting to those feelings of guilt or you'll become paralyzed with indecision because it's all you can think about. So, where does guilt really come from and what causes it? And, how do we deal with feeling guilty all of the time? To eliminate those feelings of guilt, it really helps if you can take a moment and ask yourself what are you thinking about? Are you thinking about what you don't want (people being mad, etc.) or what you do want? Once you focus on what you do want, then you can start thinking of actual solutions and work towards that. Usually, you'll find that as soon as you start that forwards motion, the feeling of guilt will go away. Continuing to focus on how guilty you feel will only serve to keep you stuck feeling anxious and confused. I also find that as long as you're focused on the feelings of guilt, it doesn't matter what you do, you're going to feel guilty because that's what you're concentrating on. You'll keep thinking there's something else you should do or keep beating yourself up that you should have done more when you had the chance. You're focused on the guilt instead of the real situation. If you turn your thoughts to focus on what you want and then ask yourself how can you achieve that, you're able to move forwards. You won't be stuck feeling like there's nothing you can do. You're able to take action which is one of the things that really helps to eliminate those guilt feelings. You're not just taking action to relieve your feelings of guilt, you're taking action to solve the real problem or situation. A situation happens and without really thinking about it you react by feeling guilty. You feel guilty for what you've done no matter what it is. I went through a situation recently where one of my parents was quite sick. I instantly felt guilty because I hadn't spent a lot of time with them recently. So, instead of really considering the situation and what I should do about it, I was suddenly trying to solve the issue of me feeling guilty for what I hadn't done in the past. You'll notice that point #1 was also coming in to play in this situation in that at first, I was trying to avoid being seen as an uncaring daughter by not visiting more often. What I really needed to do was to take the time to take a step back and think about how I wanted to respond to the situation in front of me. I made the decision that I did want to spend more time with them and once I'd done that then I could think of ways to achieve that. What was in the past needed to be left in the past. I needed to move forwards. I needed to work on changing things in the present, not the past. The good thing about this was that I could use my guilt as a sign of what priorities I needed to change in my life. It woke me up to the fact that I do want to spend more time with my parents while I still have the chance. So, you can actually use your guilt to realize what changes you want to make in your life. In my case, it was spending time with my parents, but it might make you realize you want to be a better friend or that you want to be more professional in your job or just that you want to do things differently in the future. You use the guilt to make positive changes in your life. Can you see how easily it is to get caught up in the feelings of guilt and to focus on that instead of the real issue? Once you ask yourself if you're blindly reacting or calmly choosing how to respond to an event, then you'll be able to decide how you want to proceed. 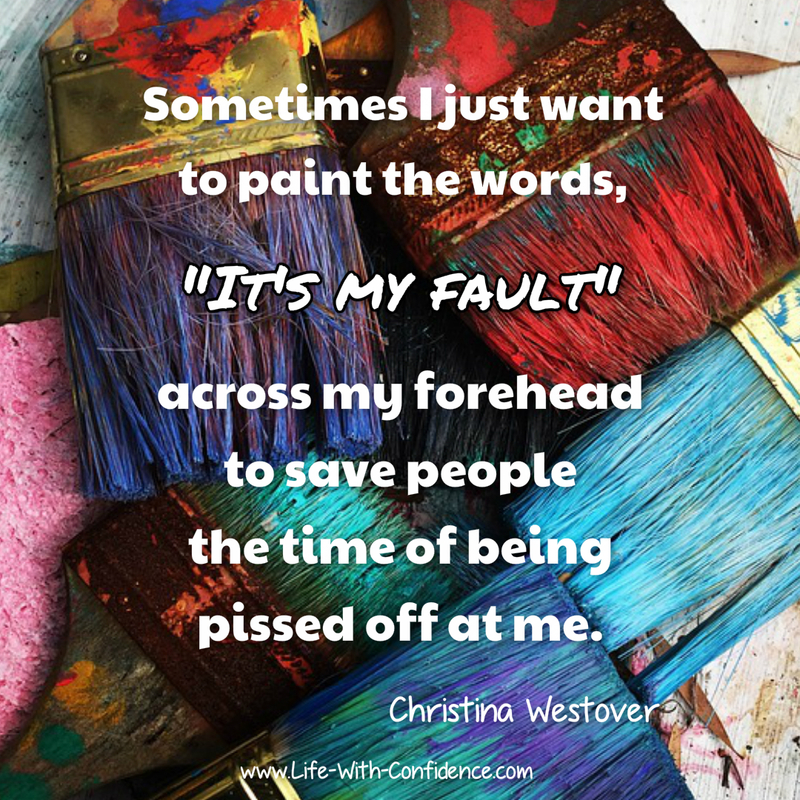 It goes a long way to being able to move past those feelings of guilt. You can think of real solutions. It's a subtle difference but it does end up having a huge effect on how you feel. You're actually using the guilt instead of just beating yourself up over things that happened in the past. You feel insecure about a certain aspect of yourself (feel like you're not good enough for example) so when someone says something your emotions react to your inner doubts rather than what's real. So, once you figure out that area that needs to be healed it's far less likely that people will be able to push your buttons. You're always going to come across those people who are absolute experts at making you feel guilty. They seem to be able to just pick up on what you feel insecure about. So, the trick is to ask yourself why is it making you feel guilty? What's the real issue deep down that's happening? Is it bringing up a past event where you felt guilty about something? Instead of forgiving yourself and learning from that past experience, you're just remembering that you did something wrong and feel like you've done wrong again. You're unable to move past that past event and all those guilty feelings come flooding back whenever a situation happens that reminds you of that guilt from that old painful moment. Once you deal with those feelings from that past event then you'll notice the comments but you'll no longer react by feeling guilty. Often, even just the awareness of why you previously reacted to certain words will be enough to stop you from continuing to react in the future. So, basically, sometimes feeling guilty is a sign of an area within you that needs to be looked at or healed. It's that awareness of why you react the way you do. What are the real feelings you're feeling when someone says something? (not good enough, no one will ever love you, not smart enough, etc.) It can actually turn out to be a gift because you can learn so much more about yourself and why you act and react the way you do. A big aspect of guilt can be because you simply don't allow yourself to make mistakes or you never forgive yourself for things that happened in the past. Everyone makes mistakes. Every single person on this planet does but for some reason we tend to hold ourselves up to an impossibly high standard and think we should be immune from that. Making mistakes is what makes us human and it's how we learn. You can learn better ways of doing things or it might even remind you of what your true priorities are. Even when things at first go horribly wrong, later you may realize what huge benefits you gained from going through the experience. It's not always easy appreciating your mistakes but they truly can end up being the most incredible learning opportunities or the catalysts that end up causing huge leaps in mental and spiritual growth. You also need to know that you made what you thought was the best decision with the facts you had at the time. You did the best you could. Learning that there are better ways to handle similar situations in the future may be a benefit of going through the situation but you didn't know that at the time. But, these benefits can't happen if you don't forgive yourself and also allow yourself to make mistakes. If you find that you can't forgive yourself for hurting someone even after apologizing, ask yourself if you've demonstrated your remorse to the other person. It's important that you express to the person that you understand how your actions impacted them and sincerely regret your actions. 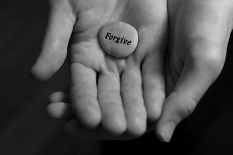 If you've done this, then it's up to the other person to decide whether they forgive you or not. You should still forgive yourself for you've done all that you can. Instead of continuing to try and force the other person to forgive you, you may need to leave them alone to process through their own feelings. Trying to force someone to change will usually only make the situation worse. Focus on forgiving yourself for what you've done. Learn from the situation, vow to do better in the future, and let the negative guilt emotions go. Once you've learned from the situation, you don't need those guilt emotions anymore. Quite likely as you were growing up you learned certain things about the world. How about things like, “You should think of others before yourself” or that you’re selfish if you don’t instantly help people as soon as they ask. These are beliefs that you’ve taken as truth and you’ve never taken the time to think about whether it’s a good thought for the situation in which you're currently involved. For example, if you’re on an airplane and it’s just about to crash, your ingrained belief of helping others before yourself could be a disaster in that situation. It would be much more beneficial for you to remember what the flight attendants told you at the beginning of the flight and to put on your own oxygen mask first before you help others. But, you’re used to just reacting in a certain way when a situation occurs. You need to be aware of how you're reacting and why. Is it really the best response or are you doing it just because that's what you've always done? Also, what you did as a child might not be the best response as an adult. For example, as a child, you were probably taught to be obedient to everyone else. This may also have led you to believe that everyone else is more important than you. Being an adult will require you to learn to let go of certain childhood beliefs like this. As an adult, it's important that you clearly define your own boundaries and decide what you will and will not accept but also what you will and will not do. You also have to learn to stand up for yourself while knowing your wants and needs are important too. So again, it comes back down to taking the time to really think about what's happening in the situation and not just blindly reacting from a conditioned response. This is one that causes a lot of grief. Hanging on to those "should's" no matter what makes things so much harder than it needs to be. You'll think something like, "I should have known better", "I shouldn't upset people", "I shouldn't make mistakes". Whenever you catch yourself saying "should" know that it's a clue to why you're in so much pain. Thinking the world should be a certain way is a waste of energy. It's the way it is. When you catch yourself saying "should" about something, ask yourself how you would feel about the situation if you simply dropped that word? Imagine that the word "should" no longer exists. A lot of times, just by doing that, you'll suddenly feel so much better about the situation. This goes hand in hand with "#1 Trying To Avoid Something" but it’s a realization that you’re focusing on what you’re afraid of and what you fear will happen if you do or don’t do something. You allow your feelings of anxiety and fear take over your rational thought. If you're aware of this, then it's easier to let go of all the "what if's...." worrying because you suddenly realize you're focusing on the wrong thing. Let those "what if's" go and concentrate on the real issue at hand without adding the fear of what might happen. If you can do that then you'll suddenly find the situation is nowhere near as overwhelming as it first appeared. You haven't let your imagination go wild with all the things that "might" happen. You'll also be able to stop those guilty feelings before they start. You can also feel guilt if you don’t live up to your own standards. For example, if you believe that you must be ten minutes early for every appointment but the traffic is bad one day so you end up being late, you'll feel terribly guilty. You'll also believe that you've let yourself and everyone else down setting off feelings of shame. These are standards you've created for yourself. 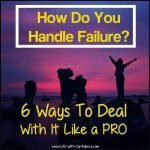 In some cases, you may be holding yourself up too high of a standard that's causing you more grief than it's helping you. For example, with being on time, know that you're always going to try to live up to this standard but sometimes there are going to be circumstances out of your control and it's not possible to always be early. In those cases, a phone call that you're running late would most likely be acceptable to others and they would understand. You wouldn't need to feel guilty in that situation because you've done the best you can for that particular situation. Be okay with it and know that the majority of the time, you do live up to your standard but also there are going to be times when it's not possible. Here's another example of standards you may have for yourself. 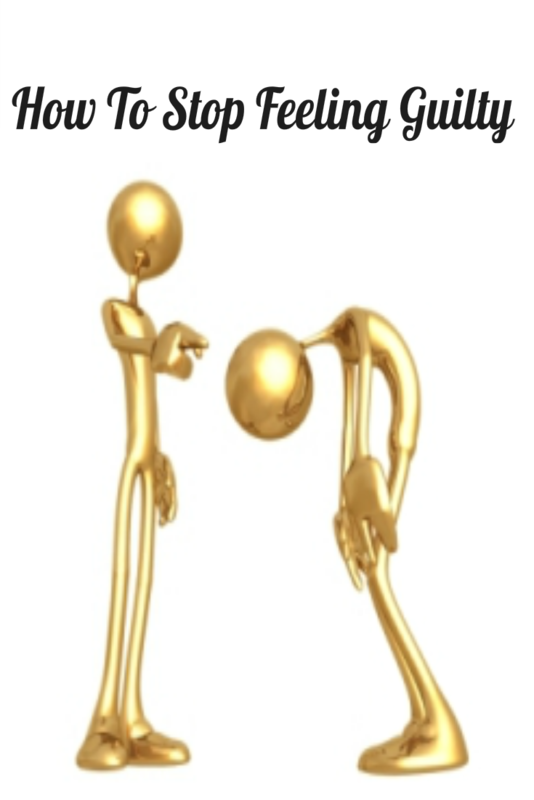 During interactions with people, you might end up feeling angry and resentful towards them. Afterwards, you might feel guilty that you're feeling these emotions towards the other person. You think you "shouldn't" feel that way. In this case, take the time to consider why you're feeling resentment and anger. Explore those feelings. Don't just dismiss them or stuff them down or berate yourself by thinking something like, "I should be more understanding or patient". You're feeling those emotions for a reason. Listen to your emotions and figure out what's really going on behind the scenes. Don't focus on the guilt. Focus on the other emotions and why you're feeling that way. Those emotions have something important to tell you so it's important to listen. For other situations, it might be helpful for you to list your top values. What values do you most strongly identify with? This will be different for everyone. You might say family is the most important thing to you. Or it might be kindness, honesty, or even something along the lines of being a creative person. Make a list of your top 5 values. Then make the decision that these are the highest priority for you. Then when you run into situations that conflict with your values, know that you're living up to the value you hold most dear. Also, remember you're not going to be perfect every time. Use the experience as a learning moment. What could you have done differently? 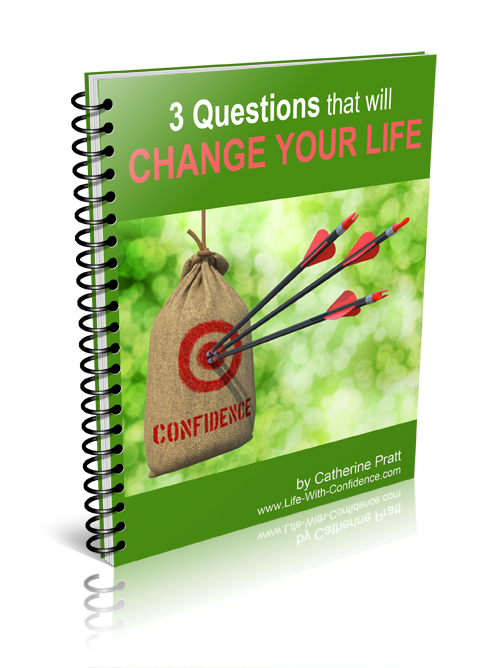 Is there anything you can change so you don't end up in that situation again? Was this a situation where you had to do the best you could at the time and not what you'd do in other situations? Learning from the situation is far more powerful and helpful than feeling sickened with guilt over what happened. Learning how to deal with guilt comes down to understanding what's really happening behind your feelings of guilt. Once you do that then you take control over your emotions and you choose how you want to respond. You won't be blindly reacting and finding that nothing you do eases your guilty conscience. This way, you rule your life, not your emotions and fear. You're also back to making the best decisions for you and those you interact with. It really is a powerful moment when you see behind the simple emotion and realize that you were giving up your own power for no reason. No more feeling guilty, or at least, only for a few short moments until you discover what it's really trying to tell you. Use those emotion so you can confidently move forwards. Emotions are so valuable if you take the time to listen to them. 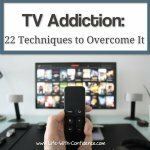 So, no more struggling with guilt. You now know how to use it to your advantage. Appreciate your feelings of guilt because they really can tell you a lot about yourself and what actions you need to take to improve your life and by using this knowledge you can turn your feelings of guilt into a good thing. Feeling Overwhelmed? How to stop it at its source. 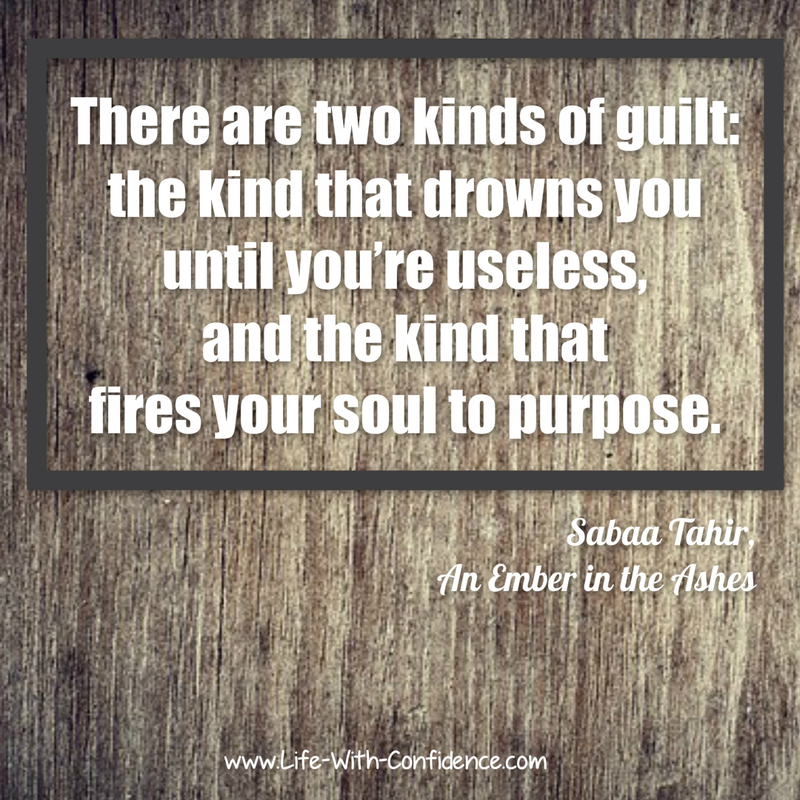 Guilt is just one aspect of the deep emotional pain we sometimes feel. Dr. Mercola has a good article on his site called 5 Recovery Tips for Healing Emotional Pain. The Happy Sensitive has an excellent article on why guilt gets in the way of happiness for sensitive people. If you find yourself in a situation where one particular person seems to have the ability to constantly make you feel guilty and that you can't do anything right, then you might be dealing with what I call a "blamer". They always blame someone else for anything that goes wrong. They always make it seem like they're the innocent victim and that you're in the wrong. One of the techniques they often use is guilt. They make their victims constantly feel guilty about anything and everything. This is a very specific type of personality. If this is what you're going through, then you need to learn to protect yourself. 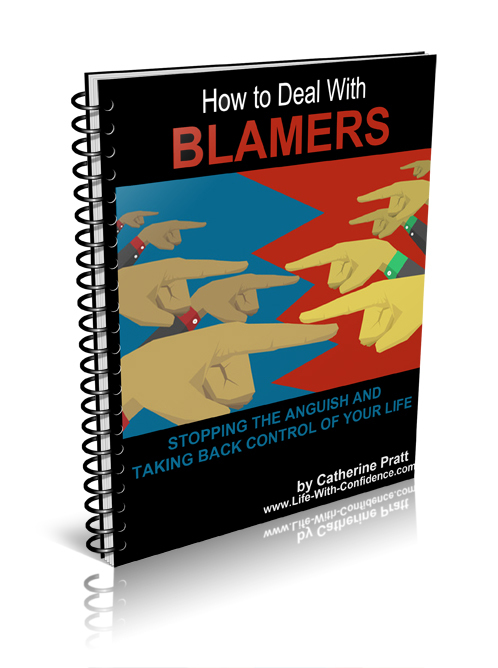 Download a copy of "Blamers - Stopping the Anguish and Taking Back Control Of Your Life" now.